The Application Menu can be opened by selecting the File tab within EDP. Open – Users can open an EDD or format file. When initially opening the application menu, a list of recently opened items will appear in the right pane. Save As – Allows the user to save the currently loaded EDD under a different file name or save a reference value file (*.rvf) for use in Standalone EDP. Save – Allows the user to save the currently loaded EDD. 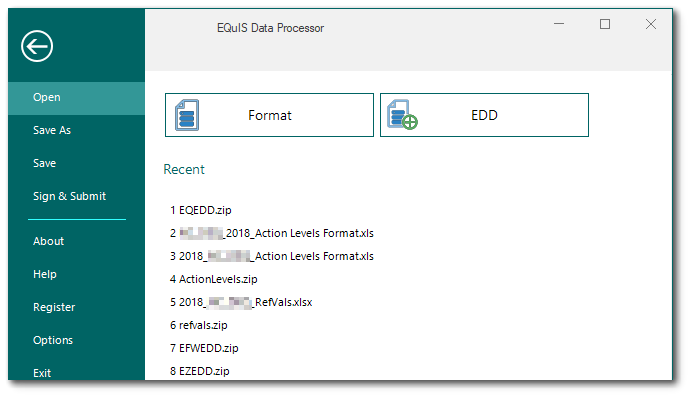 When saving an EDD as a .zip file in EDP (either using the Save menu or Sign and Submit), the default file type in the .zip is now a tab delimited file (.txt). Sign & Submit – Users can digitally sign the EDD and submit it to an Enterprise system. The format and Enterprise site must be set up to accept sign and submit. About – Displays the version of EDP as well as the version of the different *.dlls associated with the installation of EDP. Help – Opens the help documentation. Register – Allows the user to register the EDP software for new formats as well as extend maintenance. Options – Presents the user with several customization options, including program defaults and error message colors. Exit – This exits the EDP application. •There is now a Recent Files menu in EDP that shows what EDD and Format files have recently been used.